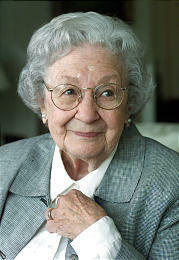 Marjorie Pay Hinckley was born on November 23, 1911, in Nephi, Utah, the first child of Phillip and Georgetta Pay. The family moved to Salt Lake City in 1914, where she was reared. She graduated from high school in 1929 and went to work at the Owens Illinois Glass Company performing secretarial duties. She never went to college, although she tried once. One morning during the Depression years she registered for classes at the University of Utah. Later that day she learned her father had lost his job, so that afternoon she took a job in downtown Salt Lake City, and that was the end of college. But she maintained a love of books and learning and took what classes she could. Marge was recognized numerous times, having named for her the Marjorie Pay Hinckley Chair in Social Work and Social Science from Brigham Young University in April of 2003, and receiving an honorary doctorate of humane letters from Utah Valley State College in April 2001. She received the Pioneer Heritage Award in July 1997 and the Distinguished Service to Humanity Award in April 1998. She also received the Utah Heritage Award from the Utah-California Women in 1998. Her husband often called upon her to speak when he spoke. She spoke at several BYU Women’s Conferences where her audiences adored her humor and insight. One book was written about her, Glimpses into the Life and Heart of Marjorie Pay Hinckley (edited by her daughter Virginia Pearce, and she wrote three inspirational books: Mothering: Everyday Choices, Eternal Blessings; Small and Simple Things; and Is This What I Was Born to Do? : Mother’s Day Booklet. Some of you have noticed the absence of Sister Hinckley. For the first time in 46 years, since I became a General Authority, she has not attended general conference. Earlier this year we were in Africa to dedicate the Accra Ghana Temple. On leaving there we flew to Sal, a barren island in the Atlantic, where we met with members of a local branch. We then flew to St. Thomas, an island in the Caribbean. There we met with a few others of our members. We were on our way home when she collapsed with weariness. She’s had a difficult time ever since. She’s now 92, a little younger than I am. I guess the clock is winding down, and we do not know how to rewind it. It is a somber time for me. We’ve been married for 67 years this month. She is the mother of our five gifted and able children, the grandmother of 25 grandchildren and a growing number of great-grandchildren. We’ve walked together side by side through all of these years, coequals and companions through storm and sunshine. She has spoken far and wide in testimony of this work, imparting love, encouragement, and faith wherever she’s gone. Women have written letters of appreciation from all over the world. We continue to hope and pray for her and express from the depths of our hearts our appreciation for all who have attended her and looked after her and for your great faith and prayers in her behalf. She died April 6, 2004. He died on January 27, 2008. This page was last edited on 1 February 2017, at 13:02.